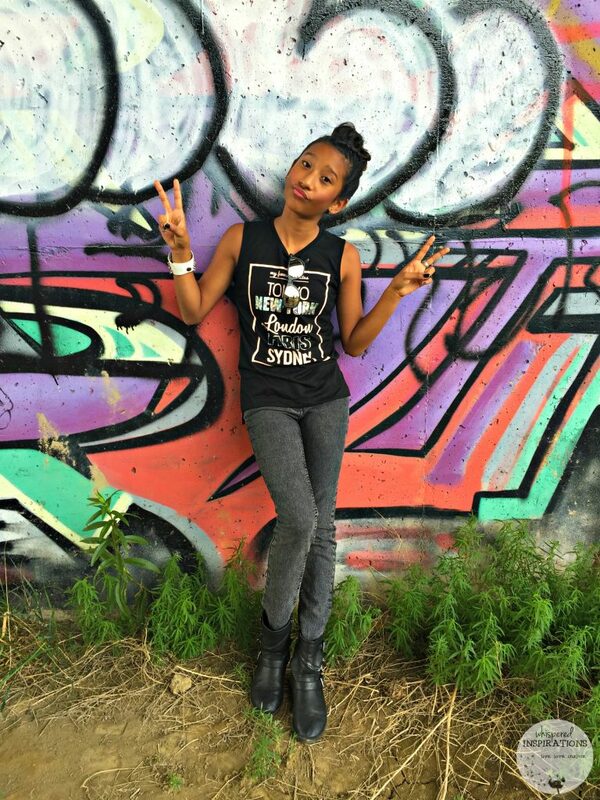 Back to School Fashion for Girls! Though we may still be getting through the dog days of summer, there is no denying that that very familiar time is once again approaching. Back to school season is near, folks. With that in mind, it’s time to start thinking about fashion choices that you and your kids will love for that first day back and beyond! Having two girls that have very different personalities, I love shopping at a place that offers different styles. Whether it’s dainty and frilly, preppy, boho, rocker or sporty. Plus, I look for quality materials that are made to last and at an affordable price. Luckily, George at Walmart has all these things and we had the chance to pick out some trendy outfits that we all loved. Mimi is still at the age where she loves everything pretty. She particularly loves bright or pastel colors, lace and she loves the comfort of a good jegging. Gabs has bloomed from that stage, so while she still appreciates all the pretty things, she likes a little edge and when she’s not rocking out her fashion threads, she wants clothes that can keep up with her active lifestyle. Gabs is pretty active and she usually opts for sportier gear as of late. But, that doesn’t mean she doesn’t love to dress to impress. She chose one of her favorite pieces to own in her closet, a classic skinny jean. She had been looking for acid wash jeans for a long time. This mere fact made me chuckle because if she had been growing up when I grew up, she would have had no problem finding an acid wash. Now that it has made its comeback, it’s all the rage! Give Me That Fashion Tee! 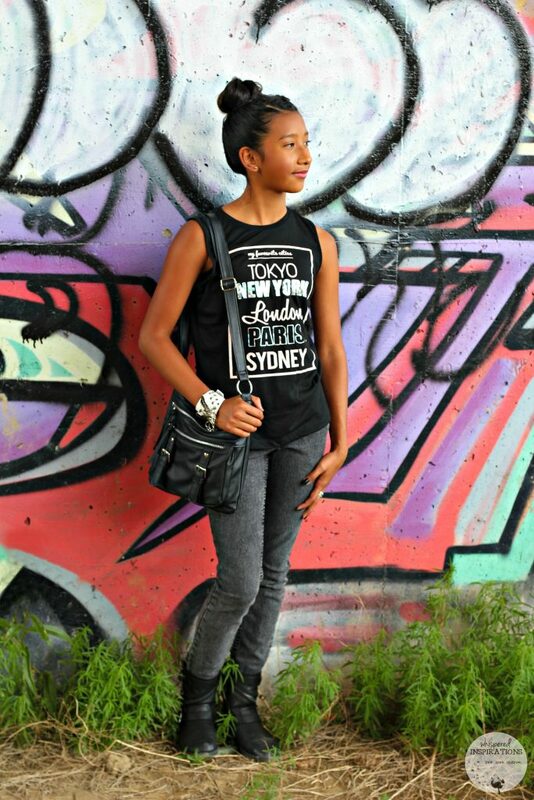 She paired the acid wash jeans with a cut-off t-shirt with an ode to all the fashion capitals in the world. Listed as ‘My Favourite Cities’, Tokyo, New York, London, Paris and Sydney are written in pink and silver. Since it is still relatively warm, this outfit is perfect for the first day back. To continue wearing it into fall or winter, all you need to do is add a black and white or black, white and pink flannel shirt and you’ll be warm and ready to go. If that’s not your thing, a cardi will do the trick. To make it yours, add your favourite bracelets and shades! Gabs also purchased George Girls’ 2 pack Seamless Racer Back bras. She loves them because she can wear them with anything! Mimi loves pastels and especially pretty. If it has lace, well, she wants it! 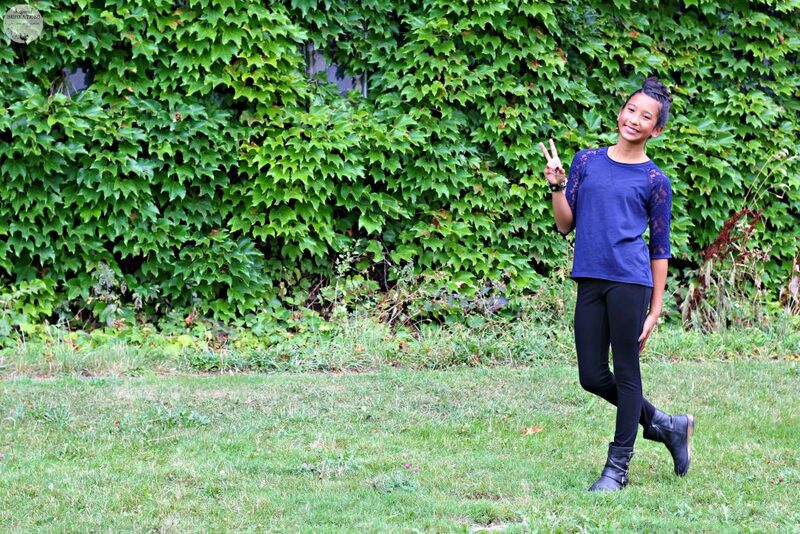 We found 1/2 sleeve shirts that are both casual and pretty. We opted for a jegging that is comfortable and is easy for her to wear. She’s still at the age where she prefers bottoms that slip on and off and doesn’t want to be bothered with buttons or zippers. This works! Plus, they’re versatile, they can be swapped and worn with nearly everything! 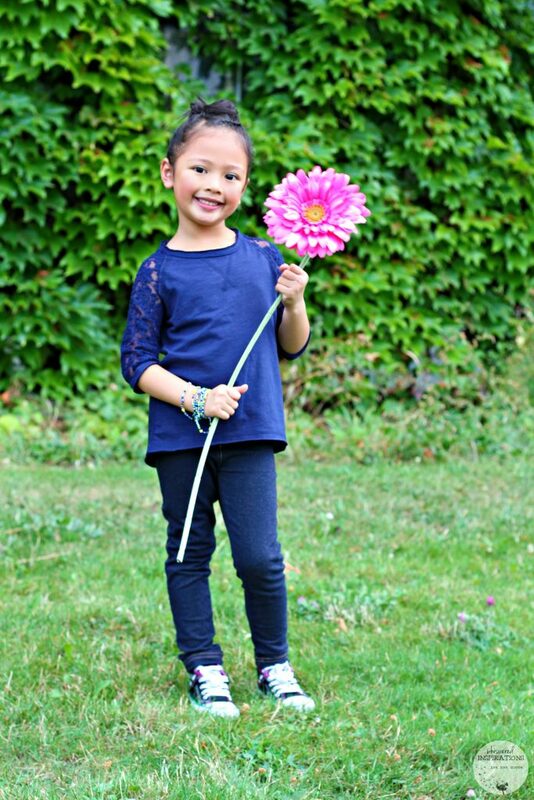 We found the same shirt for Gabby, while she steered clear from the pastels–she did love the lacy shirt in navy. We paired it with a pair of George French Terry jeggings and boom! She had a cute outfit that is not only comfortable but, casual too. 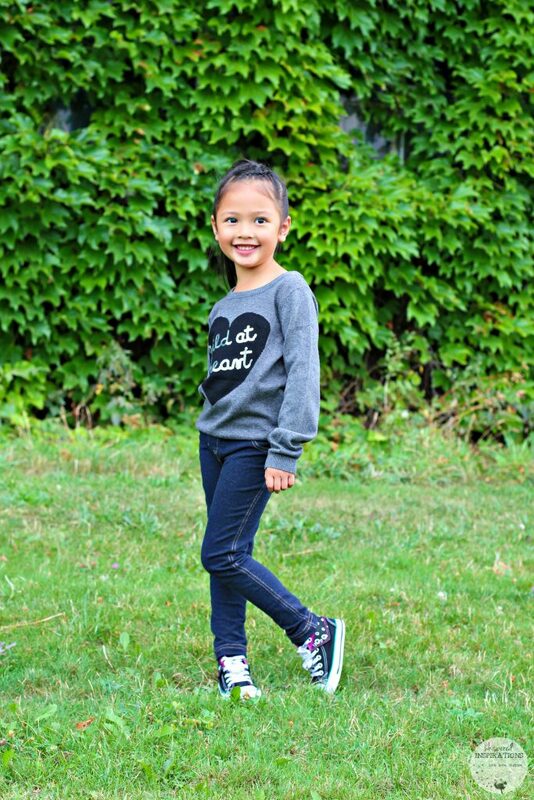 Mimi’s next outfit is super cute, she wore the same George jeggings and this time paired it with an adorable sweater. It’s light, soft and is adorned with a black heart that says ‘Wild at Heart’ in silver sequins. This was one of her favourites because she said she loves how it feels. I love that I’ve purchased this type of sweater before and it never fades! This is how you’ll often find Gabs, she loves her tights and tanks. Since recess time is always a time for basketball, tag and more – she needs clothes that give her the freedom to move and still look cute! 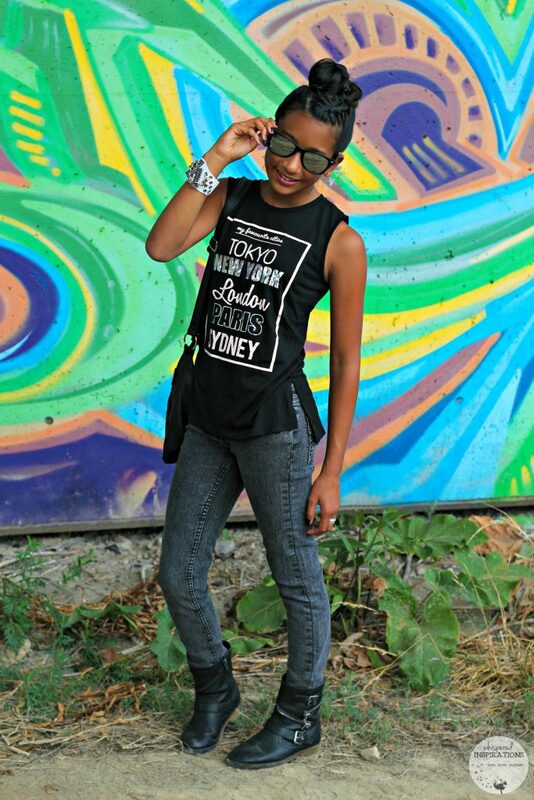 This outfit is super simple, but a hit with the tween! She chose a George plain tank top and George leggings. She made it hers by wearing red canvas shoes and by rolling up the tights. We created another outfit, but this time in a different colour. What I love is that she is able to use the jeggings by swapping shirts, so versatile and simple. I usually buy five pairs of jeggings so she has clean ones to wear all week and in different shades if they are available. 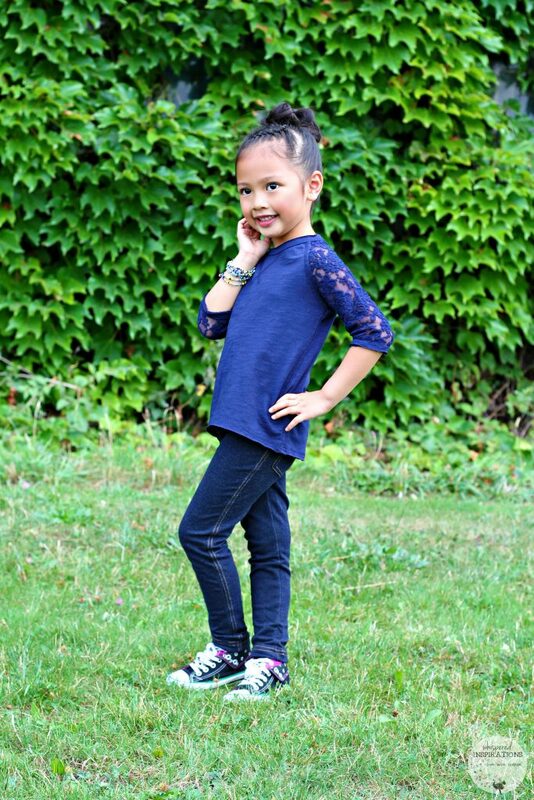 The George lace 1/2 sleeve top came in navy and since her big sister had it in navy, she wanted it too! 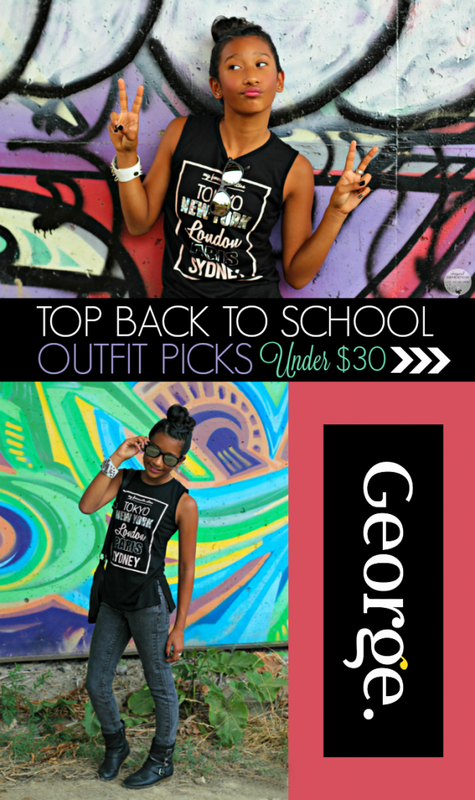 If you’re looking for affordable back to school gear, make sure you check out George at Walmart. 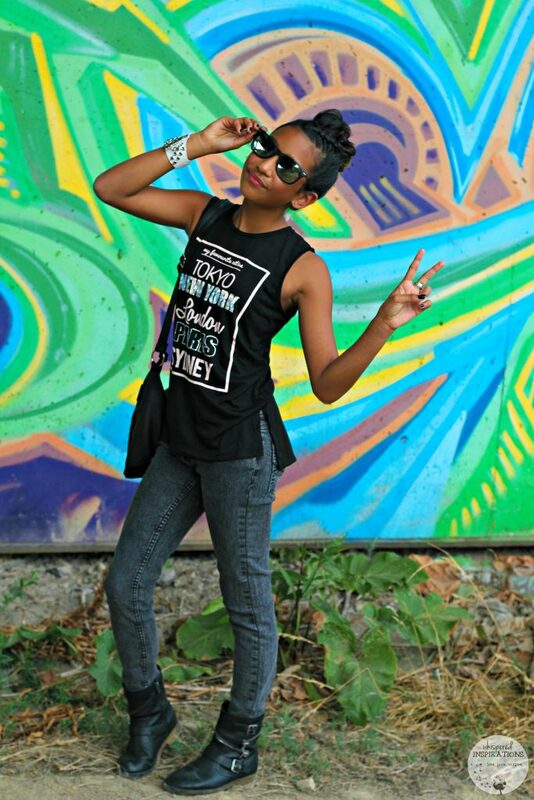 There is something for every child and their unique style because each piece gives them the flexibility to add their own flare. 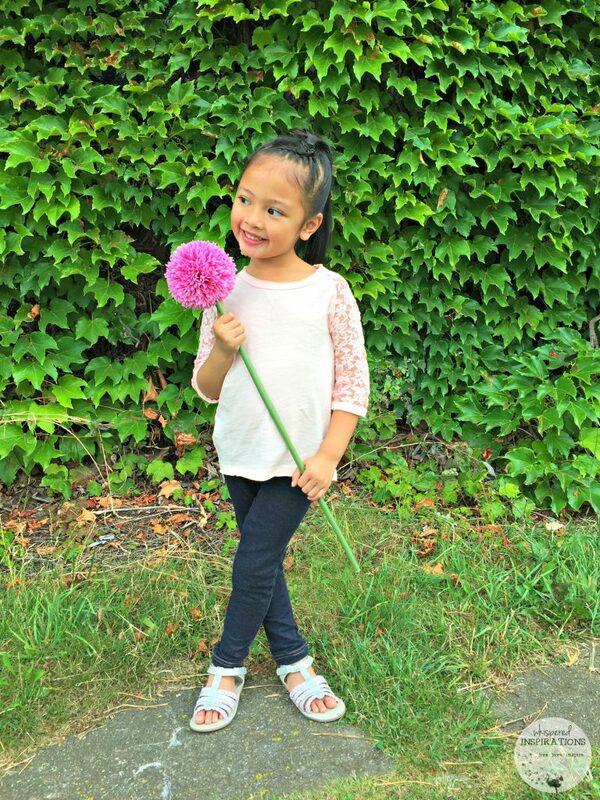 As a parent, I love quality clothes that don’t break the bank and that are versatile to swap out to make new looks. Plus, you can’t deny how cute the clothes are. For more information and to shop George, head to your nearest Walmart or visit www.walmart.ca! Follow Walmart on Facebook and Twitter for the latest updates and deals! Have you bought your child’s back to school outfit yet? This post is sponsored by Walmart Canada as part of the First Day Fashion Challenge program. In exchange for this review, I have received special perks in the form of products and/or compensation. All opinions on this blog are my own. 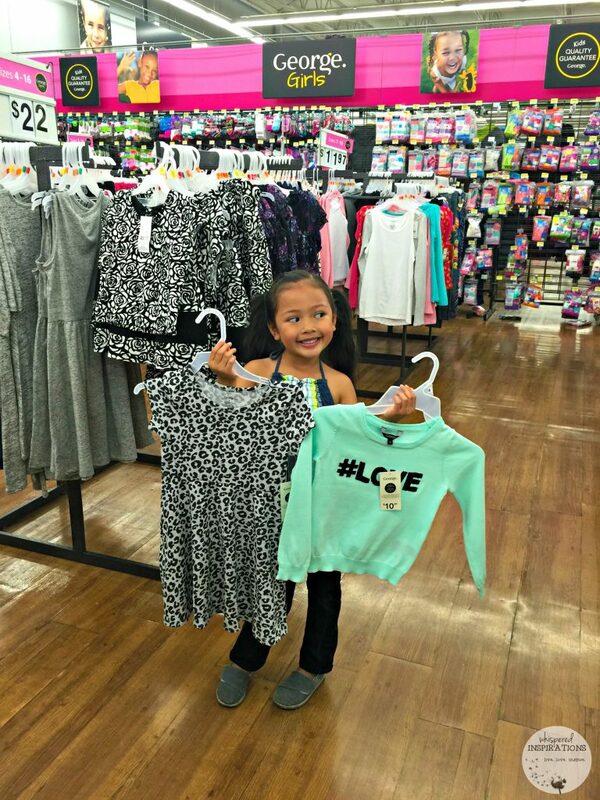 I had no idea that Walmart had all these cute clothes for kids. Looks like a great place to do some back to school wardrobe shopping. 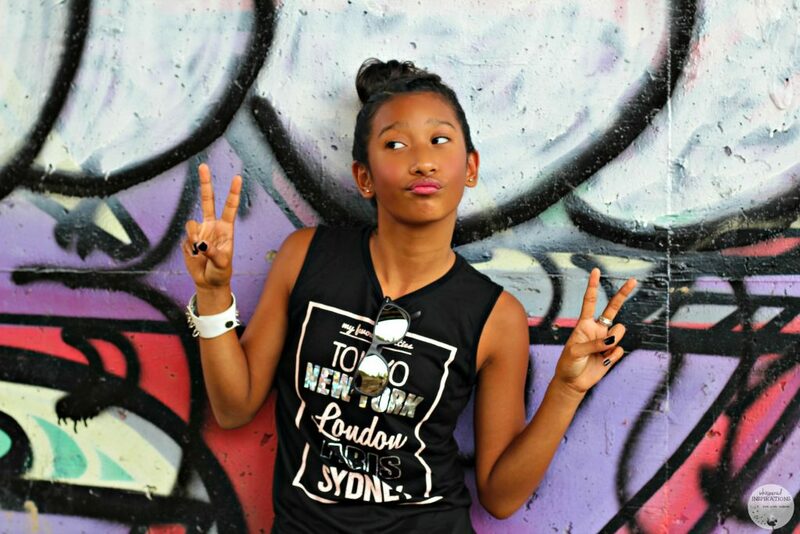 These back to school clothes are seriously the cutest! Kids fashion nowadays is so adorable, I wish they came in my/adult sizes. Haha, I wish that all the time! 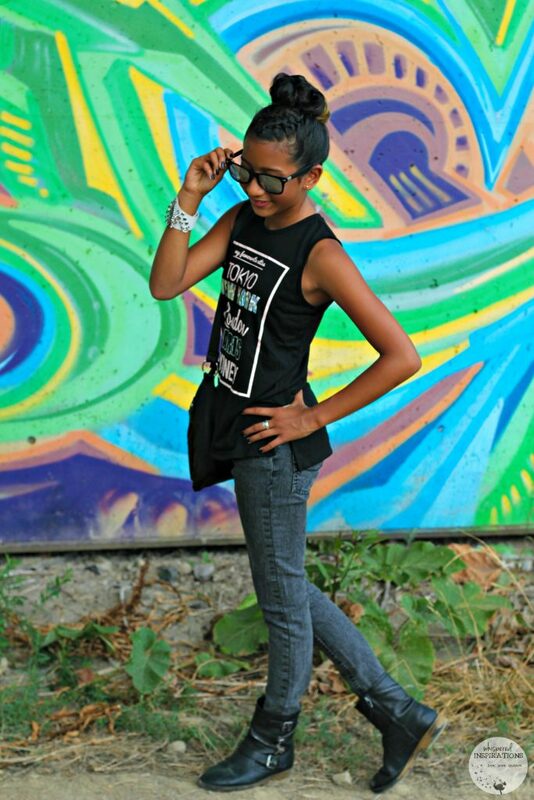 These are great photos and such cute clothes! I love them all. My daughter would love some of these too. Thanks so much! 🙂 They loved shopping for them too! Omg loving these looks!!!! Definitely the kinda things my daughter loves to wear!!! That is certainly an awesome back to school haul! I had no idea George was a good brand to try at Walmart. Will check it out. Yes, George has so many cute things! Lots to choose from, for sure! I think the clothes at Walmart have gotten nicer over the years. We do a lot of the kids back to school shopping there. Okay, your kids are adorable! Love those fashionable tops they chose! Looks like quite the selection for all ages/sizes! Thanks so much Meagan, they do have lots to choose from! What great outfits for both girls. I particularly like the top with the lace sleeves and would wear that myself. I have to agree, I love that style for myself too! Your daughter looks super cute and stylish. I really love this style for my 9 1/2 year old too. I love the styles and the clothes look really fashionable! Love how the girls are dressed! Thank-you, they had a blast shopping and modeling! These are great back to school outfits. We are going shopping this weekend. I will have to check out Walmart. Awesome, hope you find outfits! My Daughter was just asking me today when we can go back to school shopping. We have a ton of stuff to get before she moves away for University. Walmart is a great place to get everything we need all in one spot. Yes, I completely agree. Good luck with your shopping! George has great clothes. I love the jeans they make. They are so comfortable I bought a few different colors. Yes, they have so many cute styles! I need to go back to school shopping this weekend. I will have to check out the George designs for this season. It is important to get children the best clothes possible for the best price possible. It makes a difference in their self esteem. Hmm, interesting! I agree on a good deal though! What cute styles. Your girls look great. They are adorable! I had no idea that Walmart had stepped up their game like this. They really have… they have great style options! I love the choices they made,its still time to get some shopping deals in before the year starts. There is still definitely time!